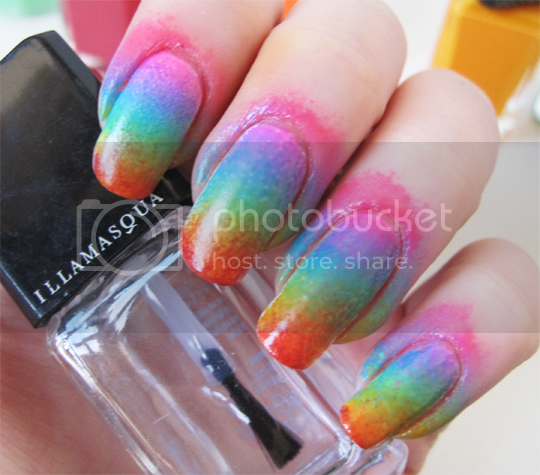 A while back, I was very excited to be asked by my favourite brand Illamasqua to create some rainbow nail designs for Gay Pride, which they are sponsoring this year. Any excuse to adorn my nails with a rainbow of colours (not that I really need an excuse! ); I spent that very same weekend sat at my desk with 7 of my favourite Illamasqua nail polishes in front of me and came up with the following three looks. They’re all very simple so there’s not really a step-by-step required, but I suppose they’re sort of mini tutorials. Make sure to stay tuned until the end of the post, as I have a little giveaway for you too! Gathered everything together? Here we go! There are few things more simple to achieve in nail art than dotted designs – and they can look a lot more intricate than they really are if there’s a lot of colour going on! 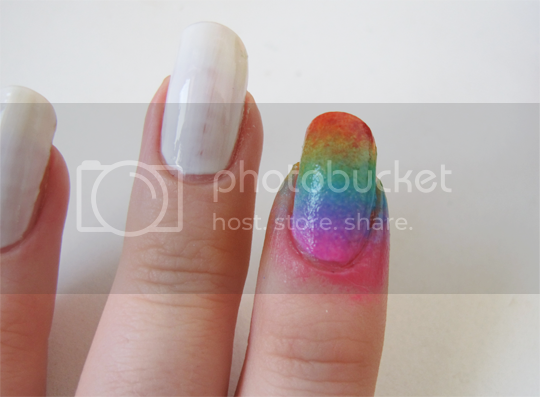 To start this one, apply a base coat and paint your nails with a white base colour. 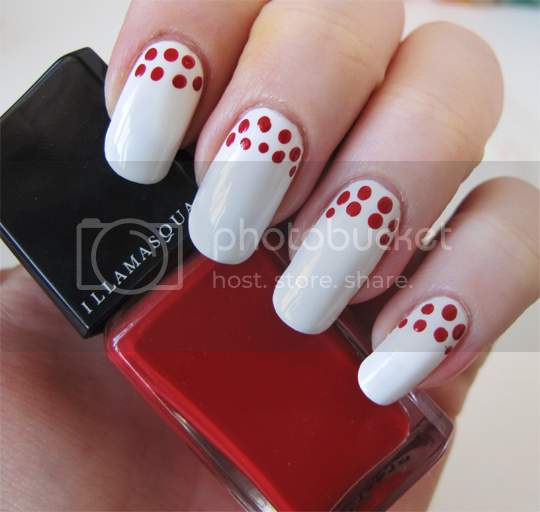 Starting with your red polish, drop a bit onto your palette and pick up some colour on your dotting tool. Apply one or two rows along each nail starting from the cuticle (this will depend on your nail length). Clean off your dotting tool – just wipe it on a cotton pad soaked with polish remover – and repeat with the orange, yellow, green, blue, purple and pink polishes. If you want to go to extra mile, you can crack out the coloured rhinestones at this point, just sticking them on to one or two dots of the corresponding colour on one accent nail, or on all your nails. 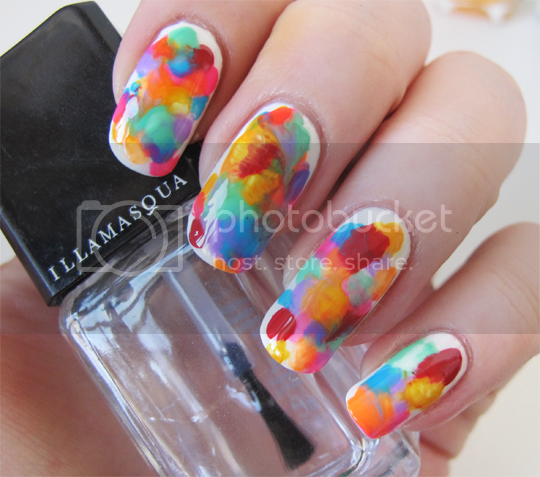 Be careful when applying your topcoat to this design because dots are very easily smudged (as you can see!). It might be best to wait until the dots are dry before going in with topcoat. Okay – one down, two to go! Now this one was more of an experiment for me than anything else. I’ve seen the watercolour nail look done before but had never tried it myself so I figured now was as good a time as any! This is the one you’ll need the plastic document wallet for. Cut 10 squares of it a couple of times the size of your nails. As before, start with a clear base coat and a layer of white polish. There’s no need to do multiple coats of white on this one as it doesn’t need to be perfect, it’s just providing a bit of a canvas for the colours. Pictured above is my ‘test nail’ on which I didn’t have a white base coat, and you can see it looks much better with one. 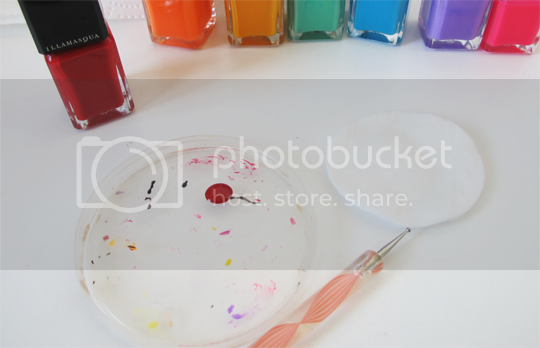 Once your white coat is dry, unscrew the lids of all your rainbow polishes. 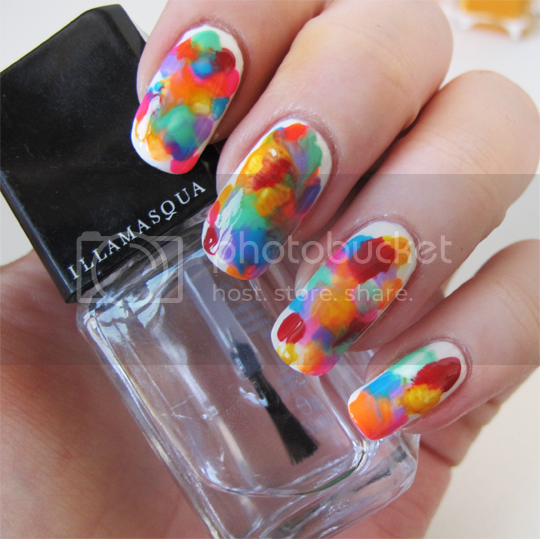 Quickly, working one nail at a time, apply a drop of each colour to a random spot on the nail. Immediately grab one of your plastic squares and place it over the nail, gently pressing it down over the surface area if your nails are quite curved. Lift the plastic away, et voila! It’s not perfect but it’s fun – it reminds me of when you used to do butterfly paintings as a kid, you know, the ones where you fold a bit of paper in half, paint on one side and squish both sides together to transfer it. Now just clean up the edges of your nails using your preferred method (I’m an advocate of pure acetone and an angled eyeliner brush) and apply a topcoat. Done! Ahh, le piece de resistance! Gradient nails are one of my favourite things to do because they’re so easy but look so good. I’m loving how it looks with rainbow colours! As with the other two designs, start with base coat and a white layer. Again, like the watercolour design the white is just serving to boost the rainbow colours this time so you only need one quick-n-dirty coat of the white. Once it’s dry, you can move on to the next step. This is where you’ll need the sponge – cut a piece that’s roughly the height of your nails, a little taller is better than a little shorter. 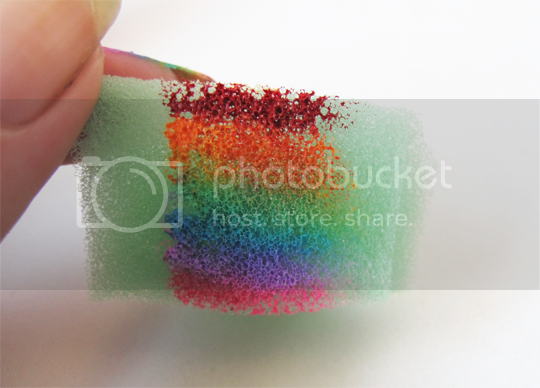 Unscrew the lids of all your rainbow polishes and working quickly, paint a stripe of each colour onto the sponge in rainbow order. 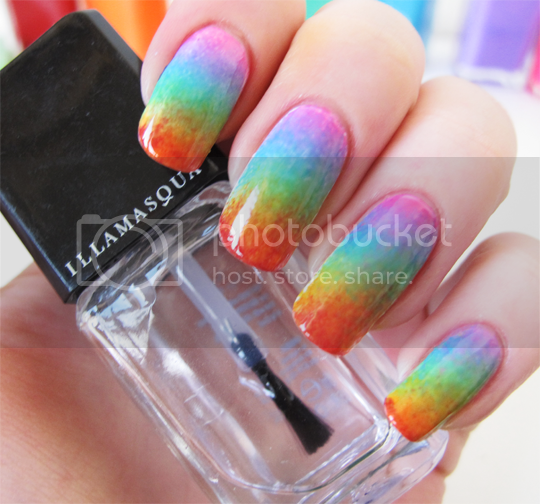 If your nails are short, you may want to do very thin stripes or just work with fewer colours. While the polish on the sponge is still wet, start dabbing it onto one nail. You might want to move up and down the nail a couple of millimetres to help the colours blend seamlessly into one another. Be warned, as you can see above this manicure does make a bit of a mess! Nothing that’s not easily cleaned up at the end, though. Naturally, clean up your filthy fingers and apply a topcoat. Regular glossy topcoat looks great, but try experimenting with glittery or holographic topcoats (these often make the gradient look even smoother). A matte topcoat also looks really cool with this design! Well done if you got all the way through that! If so, here’s your reward (not you, the one who scrolled straight past the post to get to the giveaway… I got my eye on you!). 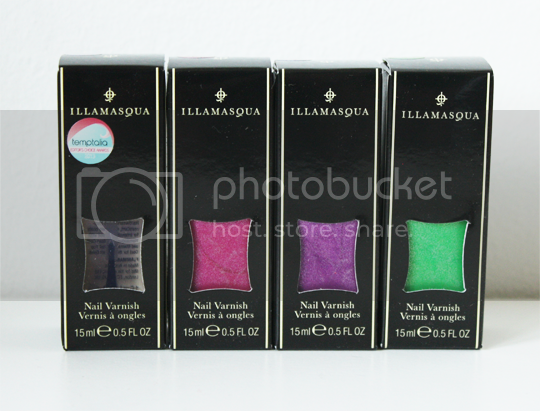 Illamasqua have kindly provided me with two sets of the glorious UV polishes from this Summer’s Paranormal collection. Two winners will each receive a bottle of the three UV colours and a UV topcoat (see my post on Omen (green) here, and some ‘secret’ nail art using Geist UV topcoat here. One of my favourite bloggers Lucy has done some amazing nail art using the polishes – be sure to check her designs out here, here and here! Anyway… nothing special required to enter, just use the Rafflecopter widget below and good luck! Sorry, I’m going to have to keep it UK only this time due to the Royal Mail restrictions on sending polish overseas. Disclaimer: Gamma, Noble, Jo’Mina and Collide nail polishes were all bought by me. Throb, Optimist and Nomad have been provided as PR samples or gifts from Illamasqua over the last couple of years. These colours are gorgeous! I love the gradient! I love the spotty one, especially the gems! Love your blog! You make my commute bearable every day, I’m going back through the years :) my favourite design id rhe polka dots – I love polka dots! I love the gradient! So simple yet I can never quite make it look right! The gradient is gorgeous. Mine never seem to come out quite as flawless as that, so I must try the glitter topcoat tip. I think the watercolour using those darn plastic wallets is genius! They get crumpled easily at my work and I hate throwing them away, so I can now bring them home and put them to good use! 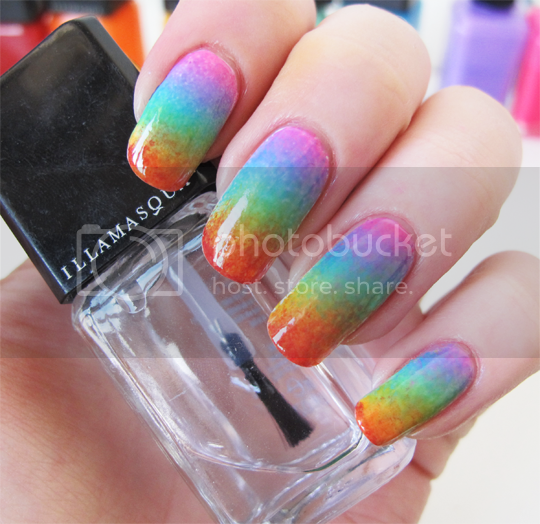 Get those gradients on ma nails! I love these nail designs, absolutely gorgeous. 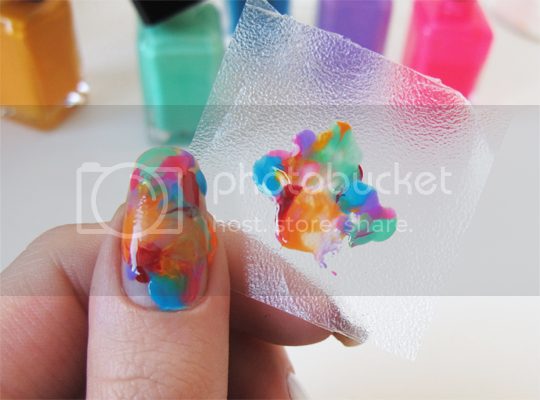 I always get a bit intimidated when it comes to nail art like this nut you make it look so easy! These are gorgeous! I’ve always wished I couuld do something nice with my nails and I’m never careful enough – but that one you did on a sponge is so pretty and looks really simple, I think I’ll give it a try since I’m stuck at home waiting for the delivery man anyway! I love the little gems on the dotted manicure! Never thought to do that before! 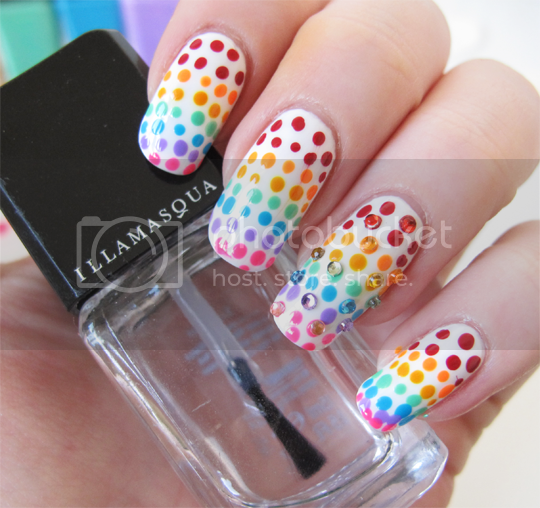 I love the polkadot rainbow design the best, the gems are just so pretty! Love the gradient look! it’s very clever. Definitely the gradient, it’s awesome! Sadly my nails are just not long enough to fit that many lovely colours on! Love omen, reminds me of Essie’s Mojito Madness which is my current go to. I have an address within the UK, so I’m in! Thanks for the raffle!! Love the Going Dotty look the most. It’s stunning :) the gemstones are just so pretty. Your nails are amazing! I love the going dotty…gonna have to try it!! Amazing post. 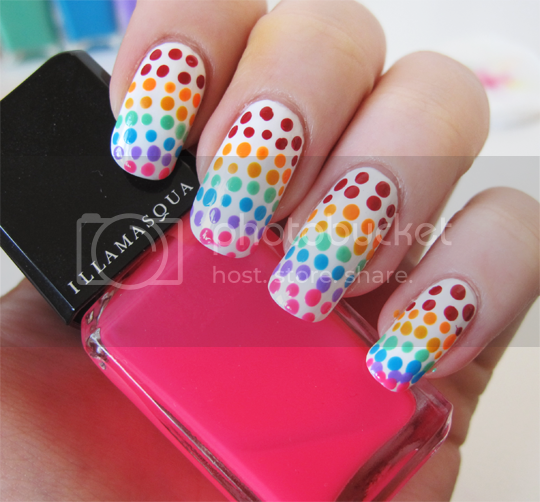 I love the dotty look!